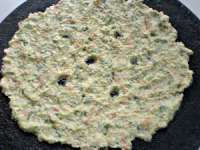 Mixed vegetable rice flour bread is a healthy variation of akki rotti. You could call it mixed vegetable akki rotti. The southern states of India use rice and rice flour in different forms. This is one of the easy rice flour recipes from the state of Karnataka. This is a yummy way of adding more vegetables to your meals. The kids love the variations too. The vegetables added can vary every time. Use whatever vegetables are easily available. Using at least 3-4 vegetables at a time adds to taste and color too. 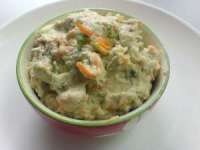 You may add cabbage, cucumber, cauliflower, carrot, tomatoes, tender french beans, fresh green peas etc. 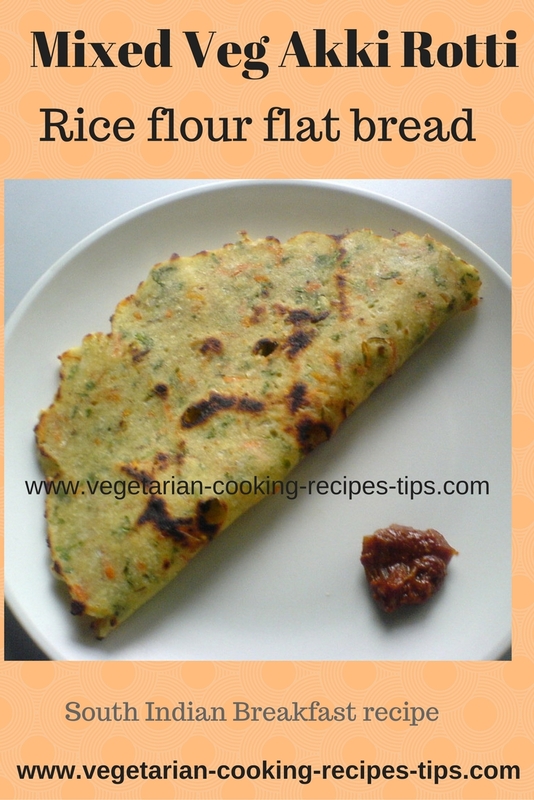 You can serve this mixed vegetable akki rotti for breakfast, a quick lunch or dinner. Serve it with coconut chutney, pickle or with a curry. A spoonful of home made ghee or butter adds to the taste of this rice roti. Ingredients: to make 3-4 large rice rotis. Fresh grated coconut - 2 -3 tablespoons. Mix rice flour, all the chopped and grated vegetables such as carrot, cucumber, chili, cumin seeds, coconut, coriander leaves, salt in a bowl. As all the vegetables contain water, you do not need a lot of water to make a dough. So add water slowly and mix. Divide the dough in 4 or 5 parts and form into balls. Place one dough ball on the tava and pat it into a round - as thick or thin as you want. Make a few holes in the middle of the roti with your forefinger. Add a few drops of oil on the roti, or in the depressions you made in the roti circle. Place the tava on high flame - So that the tava gets heated fast. Cover the roti with a lid. After a minute, reduce the heat to medium. Cook for 2 - 3 minutes. Remove lid. The place where you made a hole with your finger should have brown edges. Now turn the roti. Cook on the other side for 1 minute. Serve hot with coconut chutney, pickle or favorite curry. You may use a thick bottomed flat fry pan or girdle or a kadai to make roti. Making it in a non stick fry pan can reduce the use of oil if you wish. Adding fresh coconut makes roti soft and tasty too. You can add that according to your taste or omit it. We first keep the flame high to heat the girdle fast. If the flame is too low, the roti may become hard. Lift the lid after 2-3 minutes and check how much it is done. The aroma of the roti getting cooked, with practice, you can guess the time. When the rotti is covered, there is a sizzling sound which is also an indication that the rotti is almost done. Take off the lid and turn the roti. When you are covering with a lid, you may cook the roti on only one side until there are brown spots. There is no need to turn and cook the roti on the other side. 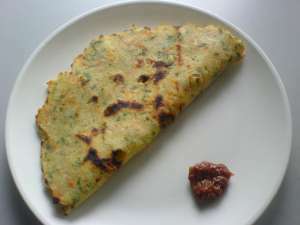 Enjoy this mixed vegetable rice flour bread aka vegetable akki rotti. Onion Akki Roti - Rice flour flat bread. Ragi Roti - finger millet flat bread. bhatura - a fried bread. Palak Paratha - Nutritious Spinach and whole wheat flat bread. Aloo Paratha - Potato and whole what flour flat bread.